Beige is a color that can create a beautiful and relaxing backdrop for the living room. While some homeowners may prefer bolder hues for their décor, those who want a more timeless look can do no better than this neutral. Color plays an important part in design. It can highlight certain areas in the room and set the tone – literally and figuratively – for the entire space. Beige is always a sure-fire win. It goes well with any other color in the spectrum, but it can be just as stunning when used on its own. From classic Victorian design to ultra-modern residences, this neutral hue suits a variety of styles as well. Exuding both elegance and warmth, beige is a color that never goes out of style. Not convinced beige is the right fit for your home? 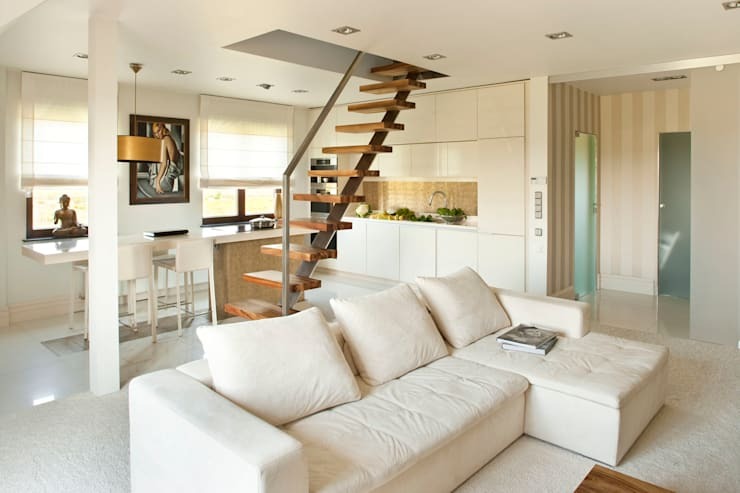 Here are homify’s top 10 living rooms that incorporated beige beautifully in their designs. In this first featured home, we see how the color can create an ultra-homey look throughout a large area. 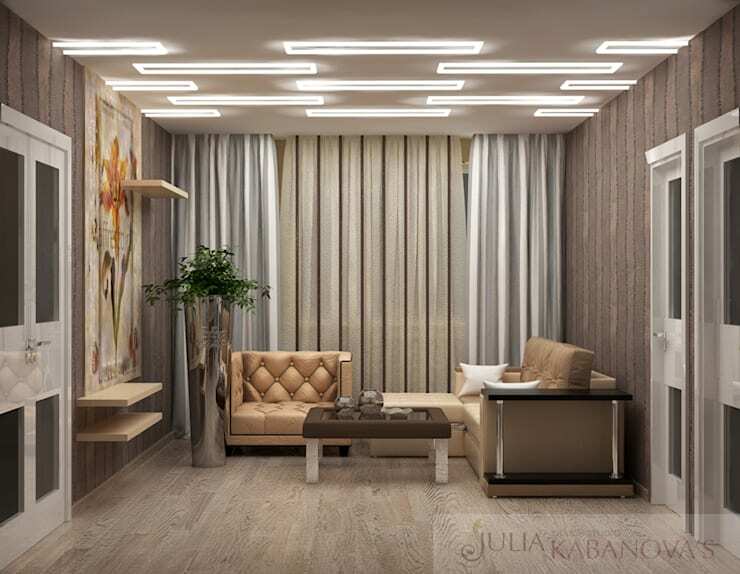 Beige furnishings and accents complement the wooden elements exceptionally well, creating a welcoming atmosphere for residents and guests alike. Notice how the designer played with striped patterns as well, proving that its possible to be more playful with this color palette in the living room. For ornate furnishings, beige is actually a popular choice. It complements gold wonderfully as seen in the featured living room above. Beige also enhances the exquisite details found throughout the space, from the chandelier to the framed paintings on the wall. Don’t be afraid to add a pop of color like the pink armchairs above. One great advantage of opting for neutral colors like beige on the walls is it’s easy to redecorate without overhauling the entire room. Beige, after all, never goes out of style and it looks great paired with nearly any other color in the spectrum. 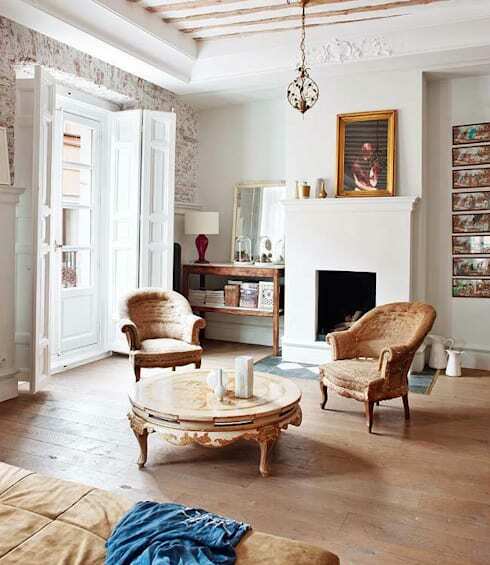 Here, we see beige used generously with white, pastel blue and wooden elements. The result is a modern yet homey vibe that works well even with contrasting styles of furniture in the space. Light is always one of the most important parts of decorating a room. Beige looks much brighter and attractive when flooded with light, so it’s always a good idea to keep the living room well-lit. A good mix of natural and artificial light is best, but even a variety of light fixtures could work in a room with little access to sunlight. Pairing beige with a darker shade of brown can be a great way to create a harmonious room layout. 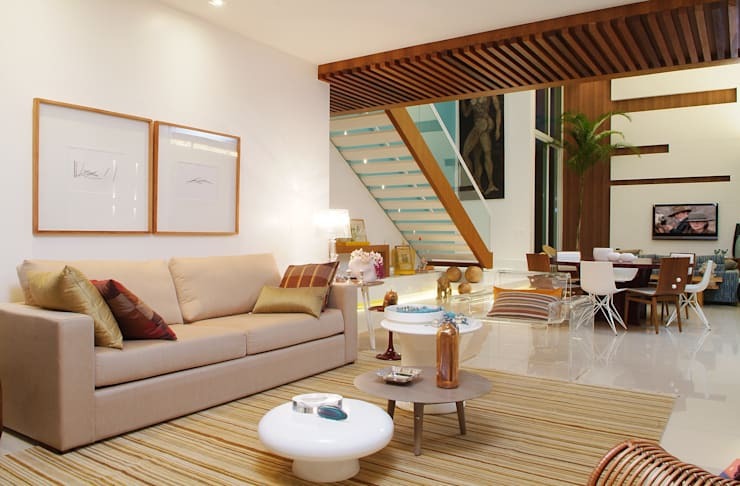 In this modern living room, various tones of beige and brown are used. The cozy cocoon is the perfect spot for residents to relax in at the end of the day. Artwork on the wall and an indoor plant add a splash of color into the space. 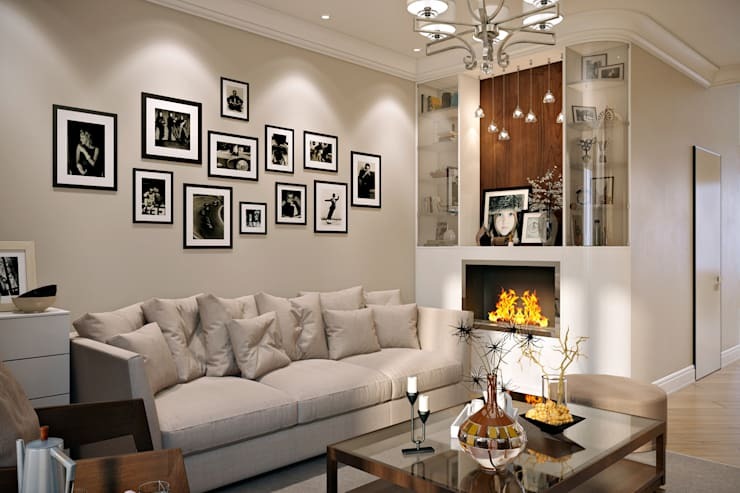 Warm beige walls are the perfect backdrop if you want your artwork to stand out. In this example, an impressive collection of framed black and white photographs are displayed on one wall. It’s also easier to accessorize with neutral tones whether you’re partial to photographs, paintings, sculptures or various travel mementos. 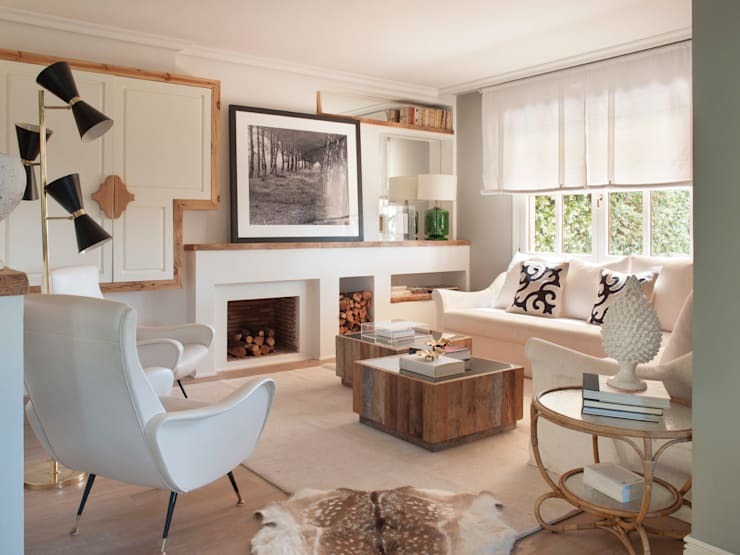 While beige is a fine choice for modern residences, it also suits a more traditional home. 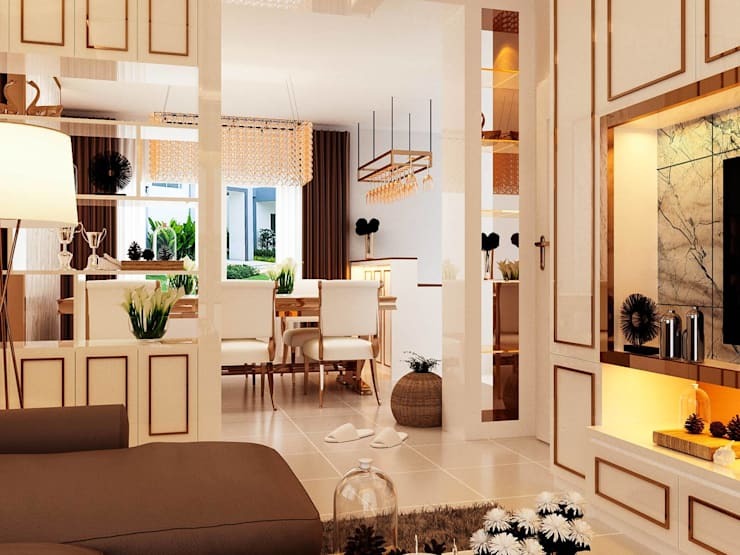 The home above draws inspiration from vintage apartments with elegant décor set against a warm beige palette. Wooden flooring goes particularly well with the subdued hue of the walls and furniture. The living room should be a relaxing sanctuary for the whole family and beige is an attractive color that promotes comfort and serenity. This sleek color also makes the living space much bigger, especially when the designer opts for a minimalist style in the room. If you’re lucky enough to have a living room with full-length windows, take advantage of it. Beige rooms appear much more welcoming bathed in natural light and residents can enjoy pleasant views and fresh air from the outdoors. Since beige creates such a neutral backdrop, you can go for bolder accessories and décor to add more personality to the home. 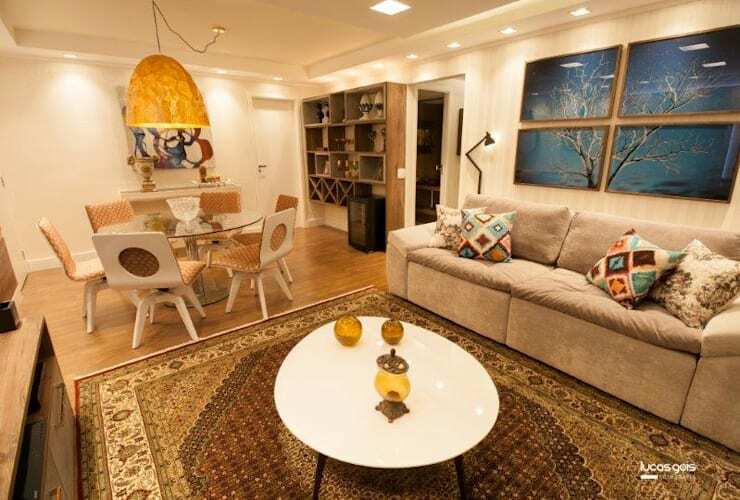 Feel free to fill the space with bohemian knick-knacks, colorful artwork and even unique furniture. After all, it’s easier to be creative with a blank yet appealing canvas. To get more ideas with a neutral palette in mind, check out these 5 two-storey homes in neutral colors.